There is a masked man who fights for those who can’t defend themselves, and he goes by the name of… No, it’s not Batman. No, it’s not Daredevil either. It’s not the Green Arrow! It’s… Zorro. Did you know Zorro was one of the inspirations for all of today’s masked, caped vigilante superheroes with secret identities? Tell your kid this as you force them to wear this costume of a character from the 1910s they’ve never heard of! But hey, everybody likes Antonio Banderas, right? What, they’ve never heard of him either? Zorro, Spanish for “fox,” is the alter ego adopted by Don Diego de la Vega (creator Johnston McCulley may just have been trying to fit as many Spanish names as he knew together) to makes sure that those who prey on the innocent will be taught a lesson they won’t soon forget. How does the nobleman-by-day, hero-by-night make sure of this? By leaving his mark wherever he can. Now your little guy can become the classic hero in this Zorro Muscles Costume. 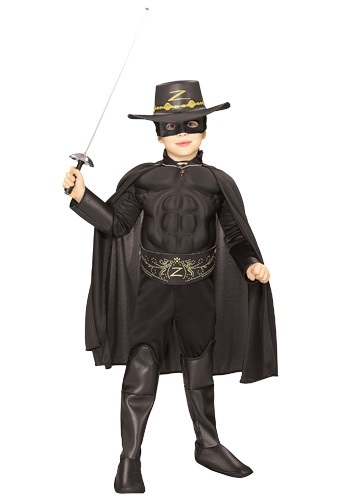 This Zorro Muscles Costume includes a black jumpsuit with a foam-lined muscle chest to give your possibly wimpy kid the beefing up they need to be the original masked vigilante, a belt with the Zorro insignia printed on it, a black cape with a gold chain, a long-brimmed hat and Zorro eye mask to protect your little one’s identity from the bad guys, all made out of 100 percent polyester.